Samsung R40 is a 15.4-inch multimedia mobile computer or laptop that features from Samsung’s Mobile Professional category. 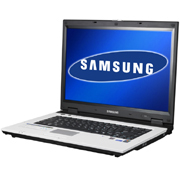 Samsung R40 features Intel Core Duo or Pentium M processor, 2 DDR2 SoDIMM memory slot, 5400 rpm 2.5″ hard disk, 15.4″ WXGA (1280 x 800) Super Bright Gloss / Non-Gloss LCD screen, Bluetooth connectivity, DVD optical drive, Ethernet LAN, Atheros Super G wireless technology and 6-in-1 Multi Card Slot. Samsung R40 weighes about 2.7kg.